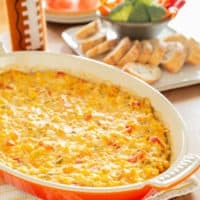 Hot Cheesy Corn Dip Recipe | Good. Food. Stories. Busted. The crinkled and yellowing page stuck on the fridge for reference wasn’t from Gourmet or Saveur, nor even a printout from Epicurious, but an Emeril Lagasse story on his Super Bowl prep after the New Orleans Saints’ 2006 comeback run. Hey, when you live with a sports nut, these unexpected rarities find their way onto your desk. And they must be tested to see what kind of goodies make the grade for a mention in SI. Judging from the number of times I’ve made this hot, cheesy corn dip over the years, I’d say Emeril knows his clientele very well. My Super Bowl menus don’t see many repeats from year to year (unless the Steelers are playing for the title, and then you know I’m making Primanti’s sandwiches), but this dip manages to get itself on the buffet table time and again. Like French onion, seven-layer, artichoke spinach, and buttermilk blue cheese, Emeril’s creamy, gooey, vegetable-studded mess should be on the short list for nomination into the Party Dip Hall of Fame. The original recipe was fantastic for serving a crowd, but a little heavy on the stomach for anyone who’s not a linebacker. 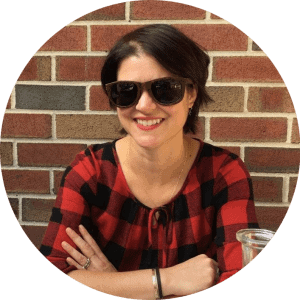 My version is much more veggie-studded, a little less mayonnaisey, and a little more appropriate for Northerners. Pssst, Emeril, the Super Bowl is played in the middle of winter. Though I love fresh corn as much as the next farm-to-tabler, maybe frozen corn is the better bet for football season? 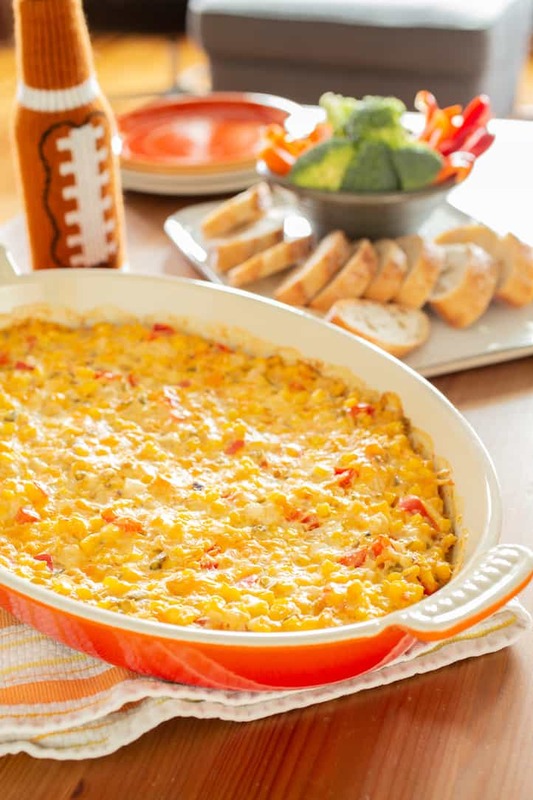 Insert your clichéd football metaphor here: hot, cheesy corn dip is a touchdown, a blitz, a soaring spiral into the end zone. It’s the party MVP, an All-Star. Excessive celebration may occur. Give this thing a trophy. 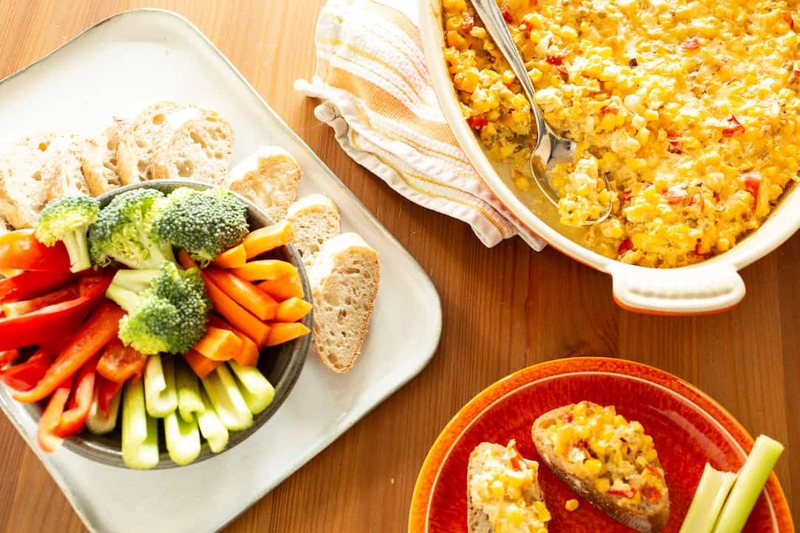 A hot, cheesy corn dip with lots of vegetables and a hint of jalapeno heat makes a perfect appetizer for the Super Bowl or any large party. Heat 1 tablespoon oil in a large cast iron skillet or sauté pan over medium heat. Transfer the corn to a large mixing bowl. Heat the remaining 1 tablespoon oil in the skillet. Add the onion, bell pepper, jalapeño pepper, green onions, and garlic. Sprinkle with 1/4 teaspoon kosher salt. Cook, stirring occasionally, until the onions are translucent and tender, 5-7 minutes. Add the cooked vegetables to the corn and mix in the black pepper, shredded cheese, yogurt, and mayonnaise. Add a few more sprinkles of salt if necessary. 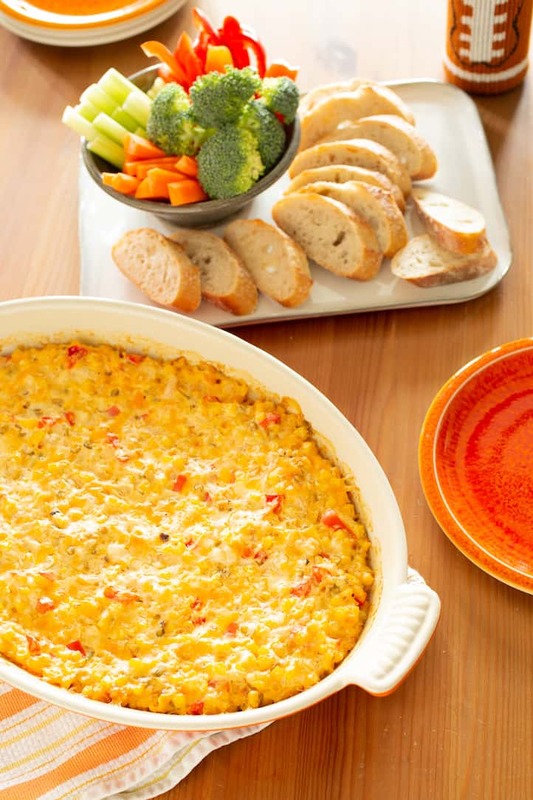 With a spatula, spread the dip in a large, shallow casserole dish. Bake for 30-40 minutes, until the dip is fully heated through and bubbling around the edges. Serve warm with tortilla chips, toasted baguette slices, or crudité.